Don't leave your performance on the NAVLE® to chance! With so many ways to review for the veterinary board exam, studying is easy with Saunders Comprehensive Review for the NAVLE® -- and it's a smart investment! In-depth coverage of essential information in each of the major veterinary disciplines ensures that you are studying with the best veterinary board review book available. 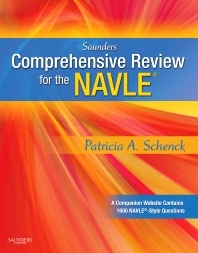 Written by noted educator Patricia Schenck to follow NAVLE® specifications, this valuable resource is the only book with CD review package created specifically to help with NAVLE® exam preparation. NAVLE is a registered trademark owned by the National Board of Veterinary Medical Examiners. This publication is not licensed by, endorsed by, or affiliated with the National Board of Veterinary Medical Examiners. This CD is not compatible with Mac 10.7 OS or higher. Elsevier currently has no plans for a new edition of this product. An online-only version may be available in the future, but there are no concrete plans for this. We apologize for any inconvenience. Exam-based structure familiarizes you with the content you willl see on the veterinary board exam and builds your knowledge step-by-step. Convenient, point-by-point outline format highlights the most essential data to streamline your NAVLE® exam preparation. Illustrations clarify and support key points. The practice quiz mode includes a pool of 1,600 multiple-choice questions that can be randomized so you can take any number of questions an unlimited number of times -- with instant feedback. The final exam mode emulates the NAVLE® test-taking experience, enabling you to complete 360 multiple-choice question at one time and receive a final score showing which content areas require further study. Case-based study questions test you on the clinical situations you will be challenged with on the exam and in practice. Answer key with rationales explains the logic behind each answer and reinforces important principles.